A bookplate is a small printed label which is adhered to a book, most often inside the front cover. 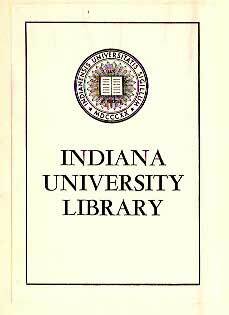 They are also sometimes known as “ex libris,” meaning “from the library of.”) They’re most commonly used to identify the book’s owner. However, some bookplates are signed by authors; they are then affixed to the book, rather than signing the book itself. Most bookplates are intended to establish ownership, with the owner’s name either printed or written upon them. Ownership bookplates are commonly sold in packages of one or two dozen at bookstores, but may also be custom-made. The “ex libris” plate pictured at top of page was custom-printed; the orange one above is a store-bought bookplate from the late 1980s. The fabulous woodcut design bookplate above was found in a 1935 edition of The Plays of Anton Chekhov. The second type of bookplate is signed by the author. Sometimes, instead of signing a book directly, an author will sign bookplates, which the publisher affixes to the books. Authors find this convenient as there’s no need to visit the publisher’s offices or to sign and perhaps ship heavy books. 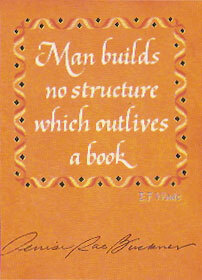 Author bookplates are sometimes found on review copies and special editions. The bookplate above is an example of an author-signed bookplate, which is attached to the front free endpaper of a review copy of Ray Manzarek’s book, Light My Fire. A book containing a signed bookplate will increase the book’s value, but it will most often command a lesser price than a book that’s been signed directly. This is because a book which has come into contact with the author is most attractive to collectors. (Think of it this way: you’re not actually buying a signed book, but rather two items pasted together: a signature, and a book. Public libraries sometimes add an identifying bookplate to their books. If an ex-library book should come into the hands of a collector, the bookplate probably will be a lesser concern than the damage & (probably) numerous other library markings typical of such books. Learn more about ex-library books..
Should you attach a bookplate? If the book is–or might become–a collectible, it’s best not to attach a bookplate, as it defaces the book & will detract from the book’s value as it is (most often) considered a blemish. Adhesives used on bookplates are often not acid-free and can damage the page to which it’s attached, as well as facing pages, subtracting even more from the book’s value. Condition is everything to collectors, who will much prefer a book without a bookplate, unless the bookplate is of some significance (see below). So, unless you’re famous, it’s best not to use a bookplate. Whether a previous owner’s, or signed, bookplates do have an impact on book values; the amount depends on the particular bookplate’s characteristics and the book in question. When selling a book, presence of a bookplate (& its location) should always be noted. An ownership bookplate usually will negatively affect the book’s value. If it’s the bookplate of a previous owner, and nicely designed or custom-printed (as opposed to something tacky, say, with Snoopy or a purple unicorn on it), it likely won’t detract greatly from the value of the book. However, consideration must be made as to whether the plate’s adhesive may, in time, damage the book. Over time adhesives may seep through the paper, affecting the bookplate, the paper to which it’s attached, and the facing page. In general, collectors will prefer an un-bookplated book. However, if the bookplate belonged to someone of great note (a public figure, noted collector, or expert on the book’s subject), it will add somewhat to the book’s value. A signed bookplate (signed by the author), is quite desirable but will add a little less to the value of the book than if the author had signed directly on the book. Does the location of a bookplate matter? Placement of a bookplate (endpaper vs. pastedown) doesn’t, in my opinion, matter when valuing the book. What matters most is what type of bookplate it is & whose name and /or signature is on it. Should a bookplate be removed? It’s best just to leave it be. Removal attempts usually don’t turn out well & the resulting blemish would detract from the book’s value more than the bookplate does. Some people collect bookplates (either loose or attached to books), often concentrating on those owned by notable people, or by designed by famous artists. There are a number of organizations & websites devoted to bookplate collecting, see the resources below for a few. If the publisher printed the bookplate, it seems that it would have been done at a later date given the “first novel” designation. I don’t know if there would be a difference in value whether the bookplate is affixed or laid in. Clancy and similar books aren’t really my forte. In any case, I think an inquiry to the bookseller is in order! Is it possible this was printed by the publisher or possibly an ex-libris by the author? Should I retain it as loosely laid in or affix it to the 2nd front free end paper? Your input would be greatly appreciated. That page is about signed books, but a book can be an association copy even if it’s not signed. I hope this helps! if the bookplate is of a famous or renowned person does it add value to a book? Generally speaking, misbound books aren’t much desired by collectors, who usually want perfect books (or as close to perfect — “fine” — as possible). But there’s always the possibility that there’s a collector of Kingsley or Cooper who might be interested in buying it. Hi Denise. Do you know of any companies that sell blank bookplates that we can provide for an author to sign in advance? Is a book from the 1800s with the wrong binding valuable? I have a copy of “Hypatia” (Kingsley) bound with the hardcover “The Pathfinder” by Cooper. I have a hard cover book titled “The Romance of Industry and Invention” (Author: Robert Cochrane). Publisher: W & R Chambers, Limited, London and Edinburgh. Though no publishing date is given but my search on the Internet shows that it was published in 1890s. This book has a a small printed label which is pasted inside the front cover. This label is from High Street Independent Methodist Sunday School, Bolton. It mentions that it is being gifted to a student for regular and punctual attendance in 1899. It is also signed by three persons; Superintendent, Vice Superintendent and Secretary. Can this small printed label be called a bookplate? Is there any way I can send you the photo of this printed label? These embossers will devalue first editions and other collectible books (unless you’re someone famous whose name adds value to books!) but they do work well as a permanent way to identify books belonging to you! Do you know where to get the item (works n the manner of a stapler) and embosses on a page your own design?